Notebooking in high school has distinct advantages over worksheet style learning. The process of notebooking builds good habits and aids in learning in a more meaningful way. Here are a few points I appreciate after using notebooking in our high school courses over the last four years. 1. 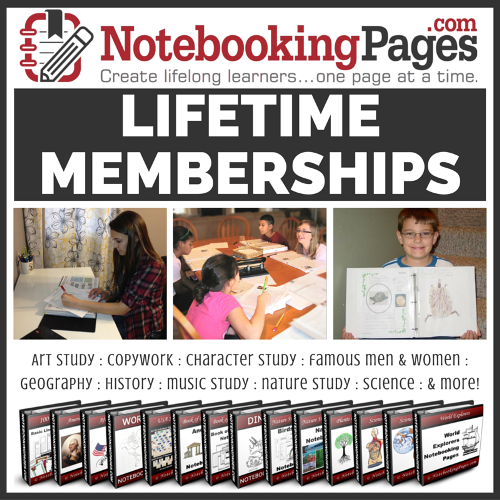 Diligence – It takes earnest effort to complete a high school level notebook page. We expect writing, sketches or an image, and thorough coverage from Mr. B and his work. Making a notebook page does not allow for guesswork. You either have something of significance to write or record on the page or you don’t. I see Mr. B working hard to fill in the notebook page in a way that shows his very best work. 2.Creative Thinking – One of the biggest benefits of notebooking in high school is that Mr. A always seemed to come up a creative angle to his pages. Notebooking can be quite right-brained. If you have a child that struggles with writing or tends to doodle, notebooking may be just the thing to try. A blank notebook page is not as intimidating as a blank piece of paper. There are places to put all those random thoughts and images in a way that connects them together, making a coherent summary of the information learned. 3. Organization and Continuity – This is where I see notebooking shine. The pages help organize thoughts. 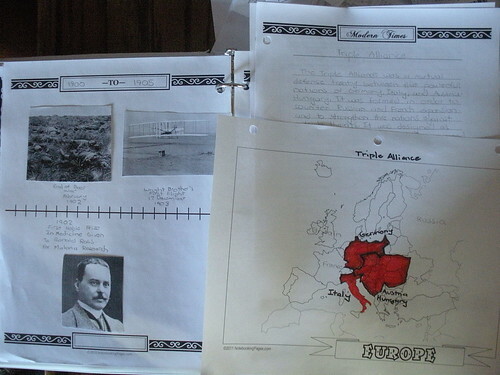 Then, the pages can be organized in a binder in a way that makes sense and they are ready for future reference. When you finish with one year, you can pick up your notebooking where you left off and continue on in the next year. If you need to review at the beginning of the school year, pull out the notebook binder and page through to get the juices flowing again. 5. Spelling and Handwriting – Our family does very little formal spelling and handwriting practice in high school (see my post on Spelling Wisdom – copywork and dictation). Using notebook pages helps me “spot check” these two areas of learning. There is no spell check on a notebook page and if I can’t read the handwriting…it gets rewritten in a neater manner. 6. 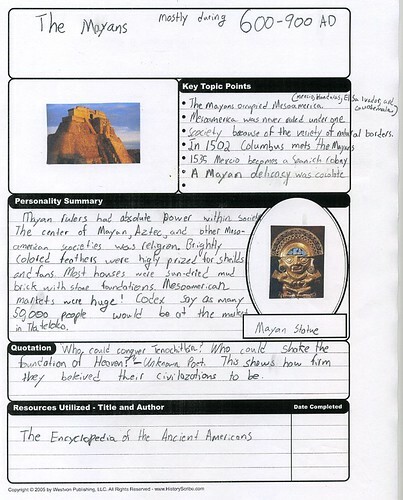 Personalized Learning – Creating a notebook page allows the student to share what they learned and what they thought about a topic. They have room for personalizing the page with the design, the topic, and the manner in which the information is shared. I am excited to add here that soon NotebookingPages.com will have a new feature for all Treasury Members! The Notebooking Publisher will allow for student to customize their own notebook pages, type in their narration, and then print the page for their notebook. Mr. A would have loved this ability to work directly from the computer keyboard. For students that have trouble with the physical aspects of writing, the new Notebooking Publisher will be an answer to prayer. Click the link below to read more about the what, how, and when of this new exciting feature. Barb ~ Even though my oldest will just be sixth grade, I’m seeing the tremendous benefits of notebooking. I can see us continuing this throughout both of my children’s homeschool experience. Thanks for the inspiration. I love Notebooking Pages, too!! Hi Barb, I’ve read your blog for awhile now and really like your approach to learning with high schoolers. We’ve just started using a more notebooking style approach with my two older kids (10th and 8th next year), mainly in History (with Pandia Press History Odyssey), but also somewhat with Literature. Would like to move into using this even more, especially with my daughter, the rising 8th grader, who loves to read and research and then go off on tangents learning more and putting it all down in some form. She writes well, organizes info well but also likes to do maps and incorporate pictures and graphics in her notebooks (they used to be more lapbook-style but have morphed this year). My main question for you is how do you do grading of this style of learning for the purpose of a transcript? I’d actually be interested in finding out how you approach grading in all of the more subjective subjects. Could you address this subject sometime? Thanks for all of your helpful posts about learning with high schoolers! You’re so right about notebooking, Barb, especially #2 in our case. My daughter is dyslexic and hated to write even as recently as a couple of years ago. Now, after notebooking for school and discovering the creative aspect, she happily writes in her notebooks, in her diary, on any pieces of scrap paper she finds…. truly the best thing we tried for her. Hi Barb! Notebooking is something I’ve toyed with in years past and more seriously this year than any other. But I’m afraid to take the plunge. Our school day already takes quite a few hours because we take our time; if I add notebooking in, won’t we just have MORE work to do? Or would it take the place of oral narrations? I can’t get it worked out in my (feeble) brain. P.S. Have you tried peaberry coffee? I’m sipping some Costa Rican I got at Trader Joe’s. Notebooking has never been an added burden in our homeschool day. As they have grown up and matured, becoming more independent, they do far less oral narration and far more written narration. It seems to be a natural progression. Our oral narration happens spontaneously during the week and then at our Friday meetings. I am in love with notebooking and the ease it makes in our homeschool. And, it is so much better than a ton of tests, though they have their place, too. I was wondering, have you found a good source for dissection notebooking pages. I have looked everywhere and can find nothing but owl pellet dissection which is not what we need. Thanks for both of your blogs. I have followed them for a couple of years now and really enjoy them and have learned so much. I love and use notebooking pages but have not made time for art. Being creative is my very favorite thing! Thanks for sharing these great benefits of notebooking! I haven’t looked as far ahead as high school, but I’m so happy to see that the benefits continue! Thanks for linking this up to Trivium Tuesdays!